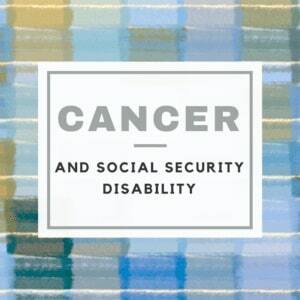 Can you receive Social Security Disability benefits for cancer? The American Cancer Society annual report found that most cancer death rates continue to fall in the United States. The overall cancer death rate has fallen by 1.8% for men and 1.6% for women from 2004 to 2008. The improved outcomes are attributed to advances in cancer screening and treatment. This is great news for my Social Security Disability clients facing the cancer obstacle. From a social security disability benefits perspective, the cancer and its treatment must first cause you to stop working at the substantial gainful activity level. In most cases, the next determination is whether the cancer and its treatment cause functional limitations on your ability to work (in both your past jobs and depending on your age – certain other jobs). Some cancers qualify as a listing level impairment. In many cases, the treatment, such as radiation or chemotherapy, causes severe side effects – such as extreme fatigue, nausea, and other problems. The diagnosis can also cause depression or other mental health problems. Each of these creates functional limitations that are taken into account in your social security disability claim and are often the reason benefits are awarded. Keeping journals of your daily problems and ensuring that your medical providers adequately document your problems can help tremendously in your quest for disability benefits. South Louisiana disability claimants have a number of great options for treatment in care. In Metairie and the New Orleans area, East Jefferson General Hospital is affiliated with the MD Anderson cancer network and offers a Cancer Navigator program. In the Thibodaux/Houma (bayou region), the Thibodaux Regional Cancer Center offers a full range of treatment and support. There are other options for care in Baton Rouge, New Orleans, Jefferson, Marrero, Gretna and throughout all of south Louisiana. If you have been diagnosed with cancer, I am encouraged by the ACS’s recent annual report for you and wish you good luck in your battle. If you have specific questions about your disability claim, please contact me at 985-240-9773 for a free consultation or take our quick quiz to see if you may qualify for disability benefits.